Exposure to violence was common in both public and private spaces, particularly at home. 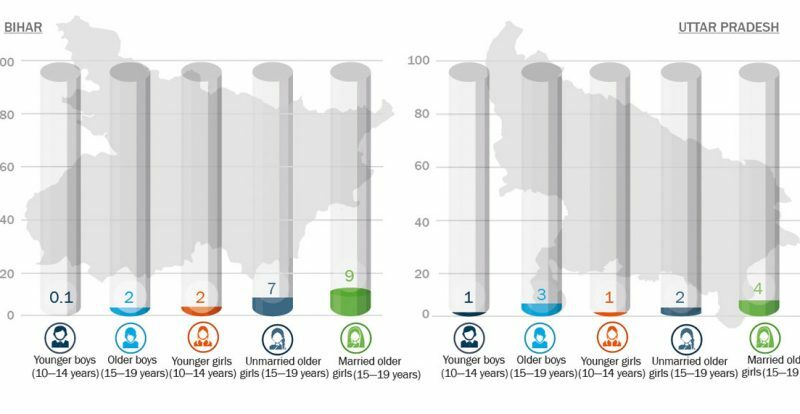 UDAYA delves into the leading causes of violence in adolescents’ lives and the impact violence has on their development. 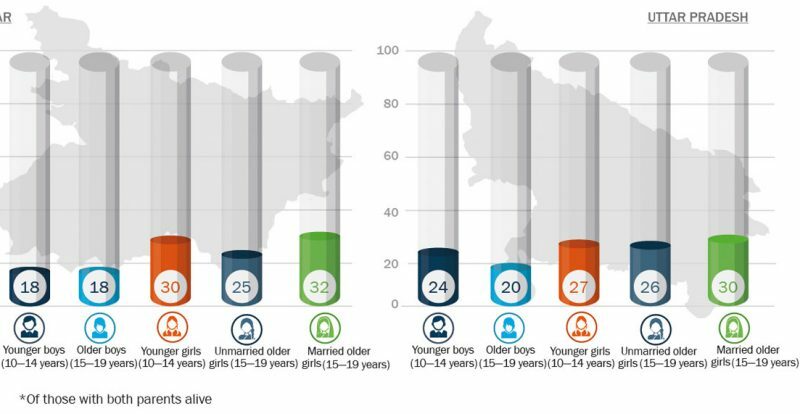 The family life of adolescents in the two states was distinctly marked by violence—both witnessed and experienced. 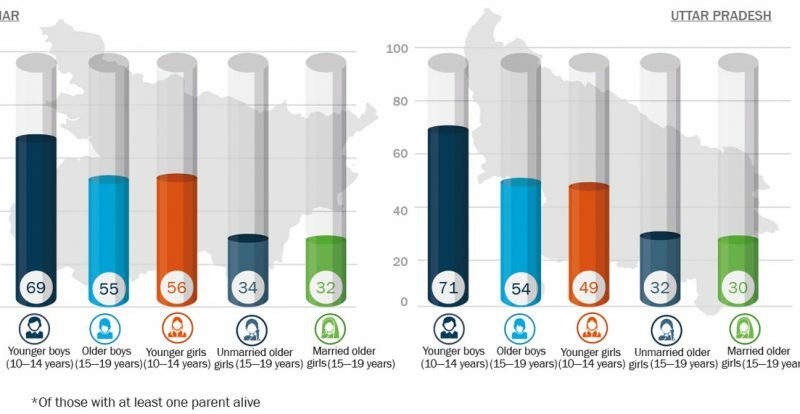 At least one in every five older boys and one in four unmarried older girls in Uttar Pradesh and Bihar (of those whose both parents were alive), had ever witnessed their father beating their mother. 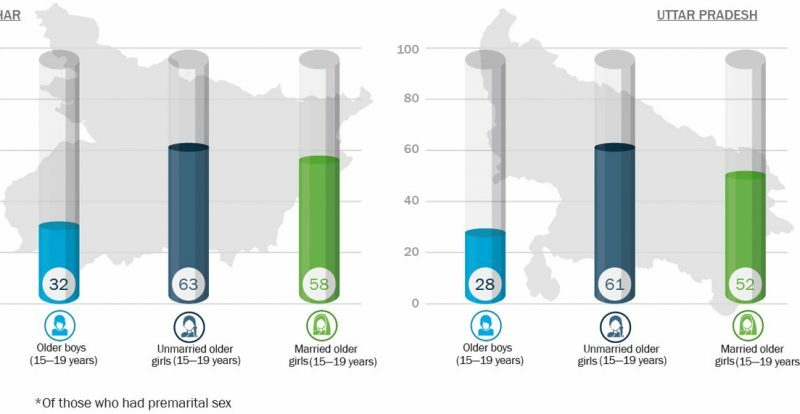 Two of every five married girls in Bihar and one in three in Uttar Pradesh—who had cohabited for at least one year—reported physical or sexual violence experience. 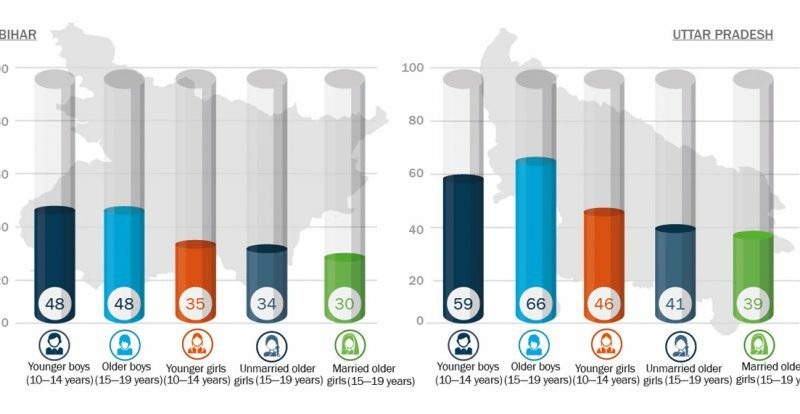 More than two-thirds of younger boys and more than one-half of older boys in Bihar and Uttar Pradesh had experienced physical violence at the hands of at least one of their parents since they had turned 10 years of age. 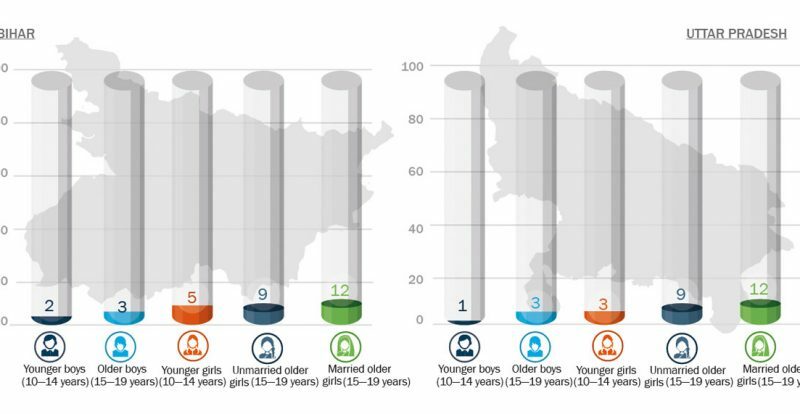 In comparison, one-half or more of younger girls and one-third of older girls reported violence by their parents. Slapping was the most common form of physical violence perpetrated by parents. Adolescents also reported experiencing other forms of violence, such as kicking, dragging, and beating or punching with a fist or something that could hurt them. Some adolescents also experienced pushing, shaking, having something thrown at them, twisting their arm, or pulling their hair. Violence within marriage was reported by considerable proportions of girls who had begun cohabiting with their husband. 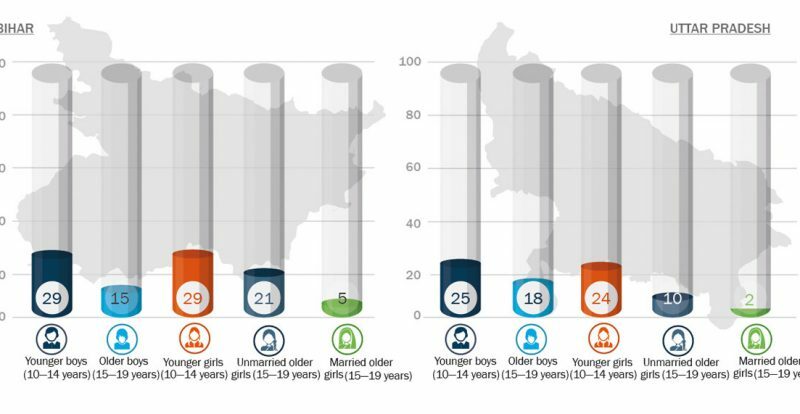 Sexual violence and emotional violence were more commonly reported than physical violence in Bihar; whereas physical and sexual violence was more commonly reported than emotional violence in Uttar Pradesh. Resorting to violence to resolve conflicts was justified by many adolescents of both age groups. 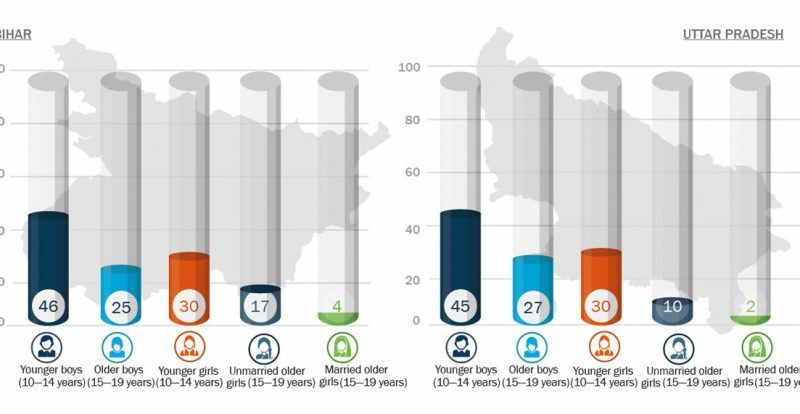 A large proportion of adolescents justified the use of violence if someone showed disrespect to a female family member or if someone showed disrespect to their religion.